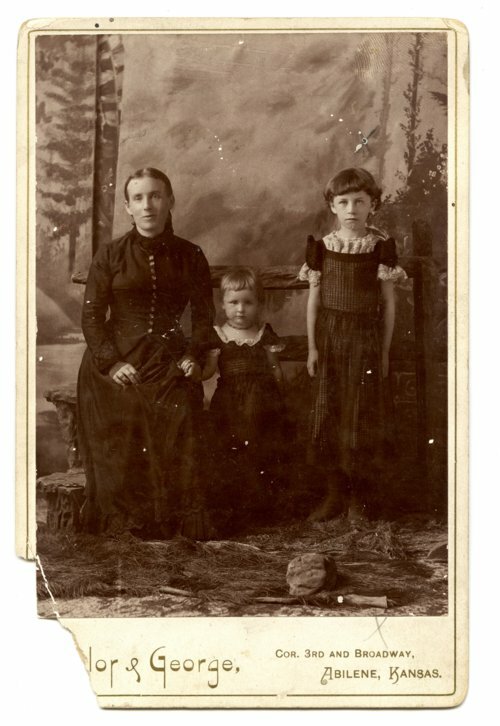 This is a photograph of Zu Adams (left), Helen Adams (center) and an unidentified girl. Zu adopted Helen in 1896. In 1876, when Zu was seventeen, her father became Secretary of the new Kansas Historical Society, and she became his unpaid assistant. Later she was given a salary and the title of librarian. At the time of her father's death in 1899, both she and he hoped that she would succeed him as Secretary. When George Martin emerged as a candidate for that position; however, Zu reluctantly withdrew her own candidacy. She worked as Martin's assistant until her own death in 1911. Zu never married, remaining in the family home and raising her younger brothers and sisters and Helen.